Back in September, we headed out to the Taylor factory in El Cajon, California for a guided tour. Our company celebrates its 10th Anniversary this year, so we decided to commemorate this milestone by ordering three custom guitars to celebrate the growth of the company from a small-town shop, to the premier products and services we offer today. Each instrument was specified by us at the factory, from body shape and tonewood, through to inlays and strings. We worked with the builders at Taylor to hand-select the specific pieces of wood that would construct the back, sides and tops for the guitars so that each would have its own unique look and sonic characteristics. We opted for the Grand Auditorium shape for all three guitars. The Grand Auditorium shape is widely popular with acoustic players as it covers the broadest range of playing styles – big enough for flat picking and loud strumming without rattle and lack of bass response, but still small enough to be comfortable to play and to capture the broad dynamic range achieved through fingerpicking. This size, coupled with a Venetian cutaway and Taylor’s ES-2 pickup, seemed to us to be the perfect foundation to build upon. 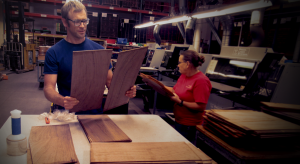 We were eager for all-koa construction for the guitar bodies. Hawaiian Koa is an exotic wood that is aesthetically striking, as well as having a rich timbral response. Whilst initially quite bright and airy in character, Koa warms and darkens as it matures, and does so much faster than Mahogany or Sapele. After only a few years play, the midrange response really begins to blossom, bringing with it a full, harmonically rich listening and playing experience. By having Koa for the back and sides also, these guitars benefit from a broader bass response and envelop a sense of true luxury that only highly figured, exotic guitars can bring to the player or collector. Mahogany is a tried and tested tonewood, known for its punchy tone and robust structure, making it the perfect accompaniment to the body. Ebony is a dark wood, but its tonal qualities are quite the opposite. Its tight-grained structure gives a bright, snappy quality which balances out the top-end of the frequency spectrum. The guitars are bound with bloodwood – an ornate wood that bears a vibrant red hue – exaggerated with a gloss finish. The guitars come with a bone nut, micarta saddles and Gotoh 510 tuners, and are ornamented with twisted Italian acrylic inlays and an abalone rosette around the sound hole. The shaded edgeburst gloss finish is thoroughly eye-catching and truly accentuates the figuring of the Koa. One of the custom orders has the signature Taylor bevelled armrest for both luxury and comfort, whilst the other two opt for satin neck finishes – the second of these being a 12-fret model, which is becoming a more and more popular spec in the Taylor range. Complete with Elixir HD Nanoweb strings designed to complement Taylor guitars, these extraordinary custom instruments are arriving with us in the next 4-6 weeks, and we feel the models will be appealing to any collector or Taylor enthusiast. As for us, we can’t think of a better way to celebrate a decade of premier instruments and customer service.